Have you ever run across a historical photo and wondered what was going on in the picture? Since the advent of photography, fleeting moments mundane to earth-shattering have been captured on film for posterity to see. So many of these photos get lost, discarded or shunned away and over generations the oral story that goes along with them disappears. This gem of an old photo was sent to us by a Guest but the big question is, why all the wheelbarrows? It must have been an important project based on the size of the work crew. Imagine the organization for the era of this photo that was required to get all local hands to report to one location at one time with their wheelbarrow in tow. Do you know the mystery? If so, leave a comment and let us know. What do you think is happening in this picture? 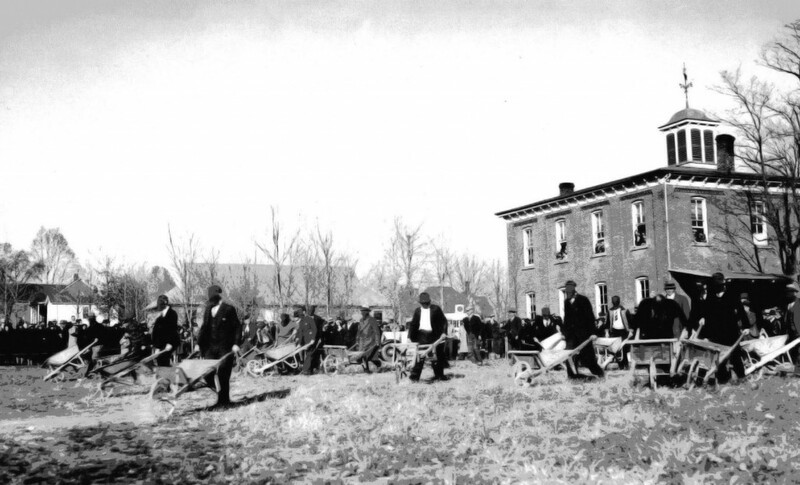 Looking closer at the men pushing the wheelbarrows, they appear to be blindfolded. Could it be some sort of a game or contest? For now, it's a mystery! The photo was taken in Mariah Hill, Indiana by local historian, O.V. Brown. It is part of my Gr. Gr. Uncle O.V. Brown's photos and negatives that I digitalized a couple of years ago. Since all the men are blindfolded, I would assume that it is a blind wheelbarrow race. Not sure what the occasion was, but an older person from Mariah Hill would probably know. I have two companion photos taken at the same time, along with this one. One of them has a women wearing what looks like a mink coat pushing one of the wheelbarrows. I believe that someone told me that the lady is Mrs. Koch's mother, Bella Yellig. Contact me and I will send you the companion photos.